Many years ago, I lived in San Francisco. Walking along shopping streets lined with boutiques, a waft of warm vanilla drew me into a tiny shop with just two tables. Behind the counter was very large crepe pan and a chalkboard menu filled with tempting daily specials. I was drawn to the vanilla crepe stuffed with red bean paste and topped with green tea ice cream. The textures, sweetness and interplay of flavors made for a satisfying dessert for a die-hard sweet tooth. 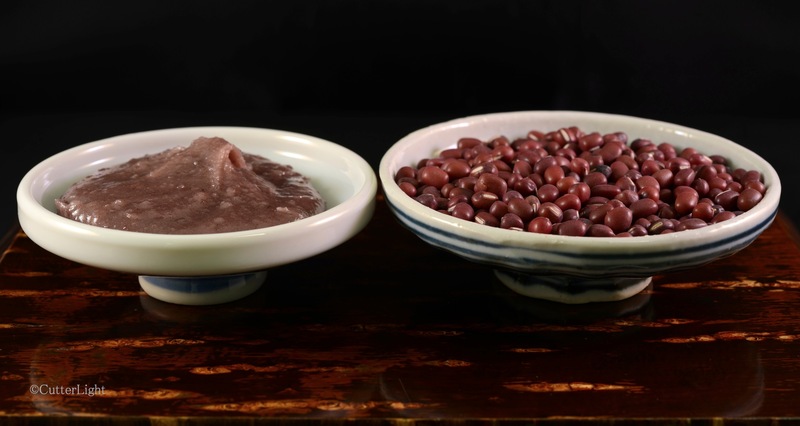 Many years later, 200 miles north of the Arctic Circle, supplied with dried azuki beans from a speciality shop in Anchorage, I was ready to try my hand at homemade azuki bean paste. It came out perfect and was featured in anpan (Japanese-style steamed rolls) to rave reviews. We can’t wait to try this paste in our own crepes. Soak dried beans overnight. Make sure beans are generously covered in several inches of water, as the water will be absorbed. The following morning, pour beans into a colander and rinse thoroughly with cold water. Place beans in a large pot along with 5 cups of water. Reduce heat to low, cover and simmer for 1 1/2 hours. Beans should be soft. Put a wire strainer over a bowl. Pour beans and liquid into strainer. Strainer should be low enough that beans are partially immersed in water. Using a wooden spoon, smash beans through strainer into water. Skins should remain in the strainer. Line a bowl with cheesecloth and pour strained beans and liquid into cheesecloth. Draw up edges of cheesecloth and squeeze out excess liquid. Put squeezed out bean paste back into pot. Add sugar and salt to the beans and stir mixture over low heat. Continue stirring until mixture is glossy and has the consistency of mashed potatoes. Thanks for the clarification, Sonya – and the new vocabulary!